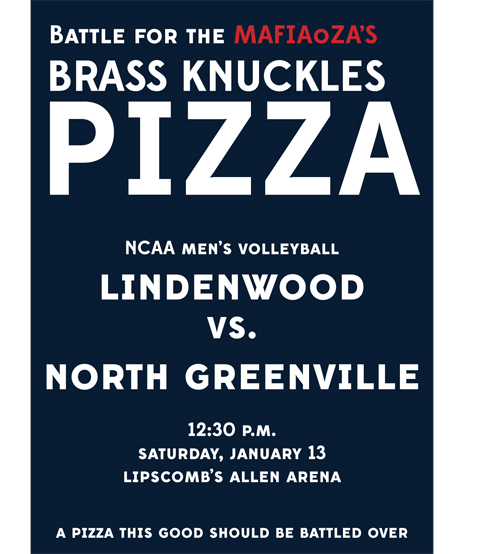 Two NCAA men’s volleyball teams that are on the rise will compete in the inaugural Battle for the MAFIAoZA’S Brass Knuckles Pizza. 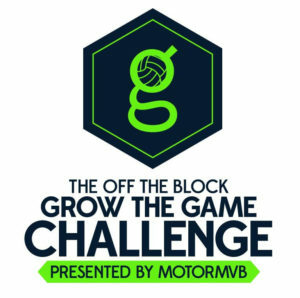 Off the Block announced Sunday that Lindenwood and North Greenville will play each other in the trophy game at 12:30 p.m. Saturday in Nashville, as part of the Off the Block Grow the Game Challenge presented by MotorMVB. While trophy games are uncommon in NCAA men’s volleyball, they are used on other college sports such as football to hype up games and emerging rivalries. This trophy game concept is being utilized for the Grow the Game Challenge as a way to spotlight certain matches during the three-day non-conference tournament. The Battle for the MAFIAoZA’S Brass Knuckles Pizza will be the first all-time meeting between the Lions and the Crusaders. Lindenwood opened last season receiving votes in the Off the Block/Springbak, Inc. Division II National Coaches Poll and ended the year nearly upsetting No. 7 Lewis in its conference tournament quarterfinals. The Lions return a majority of starters for the upcoming season under new head coach Joe Kosciw, including Freshman All-American middle attacker Sam Schindler. North Greenville finished last season in seventh place in the ConfCarolinas and reached the conference tournament quarterfinals. In addition, all-conference middle attacker Matthew McManaway returns for his senior season after ending 2017 among the conference leaders in blocks and aces. The Brass Knuckles is served at MAFIAoZA’S Pizzeria and Neighborhood Pub. The specialty pizza features a spicy wing sauce, blue cheese crumbles and buffalo chicken. MAFIAoZA’S is a Nashville eatery known for its authentic Italian menu, award-winning wine list and family-friendly atmosphere. Both the Tennessean and Nashville Lifestyles also voted MAFIAoZA’S the best pizza in Nashville. MAFIAoZA’S is an official sponsor of the inaugural Grow the Game Challenge presented by MotorMVB. In addition, the pizzeria’s Nashville location at 2400 12th Ave. is within two miles of the tournament’s site, Lipscomb University’s Allen Arena. The Grow the Game Challenge is the largest NCAA Division I-II men’s volleyball non-conference tournament during the upcoming 2018 season with 10 teams participating in the event. It also is the first time in the city’s history that Nashville will play host to a NCAA men’s volleyball event. The match result from the Battle for the MAFIAoZA’S Brass Knuckles Pizza, along all other 11 tournament matches, will count towards determining the overall tournament champion of the Grow the Game Challenge.